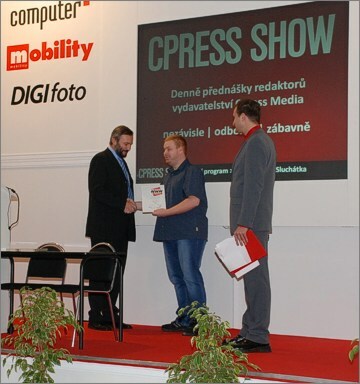 The leading Czech IT publishing house, CPress Media, his editors, the invited top experts in the areas of SEO, copywriting and graphics, and first of all, the readers of CPress' IT magazines have rated web services in the IT branch - in the contest "Nejlepší IT web 2008" (The Best IT web 2008). We are very pleased that the CAD portal of the XANADU company - CADforum.cz - has won the readers' contest and has been voted the best IT web in the Czech Republic. We would like to thank all voters and other readers of the CADforum.cz web for their rating. We appreciate our visitor's rating as we provide and develop this web service for these visitors - the users of CAD software. The most valuable asset of any company - and especially a company oriented on services - are their "people", the employees and their combined knowledge. And in the team of 85 employees of the XANADu company we have really top experts in IT areas we cover. Our specialists carry the highest certifications issued by HP, Microsoft, Autodesk, Citrix and others. Many of them are also internationally recognized experts. Meet the team of consultants, salesmen, programmers, service technicians, instructors, technical support people, backoffice and other employees of the XANADU company. Employ our knowledge to make your work easier and more effective. What we do, we know well.